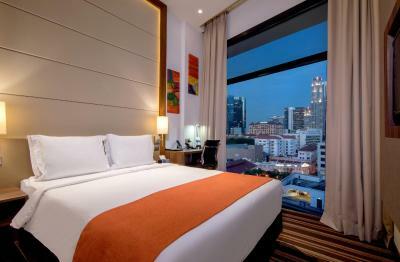 Lock in a great price for Holiday Inn Express Singapore Clarke Quay – rated 8.7 by recent guests! Nice friendly staff, good location next to the ‘Friends’ themed cafe ‘Central Perk’!! 40m roof top pool was excellent for an evening dip. Front desk was extremely helpful with local directions, tips and suggestions. Manager Lina was especially good. Complimentary breakfast has enough choice. Bed was comfortable. Nice pool on rooftop. Everything was above and beyond my expectations! Breakfast was amazing every morning, it’s very busy, but rightfully so because it’s excellent. 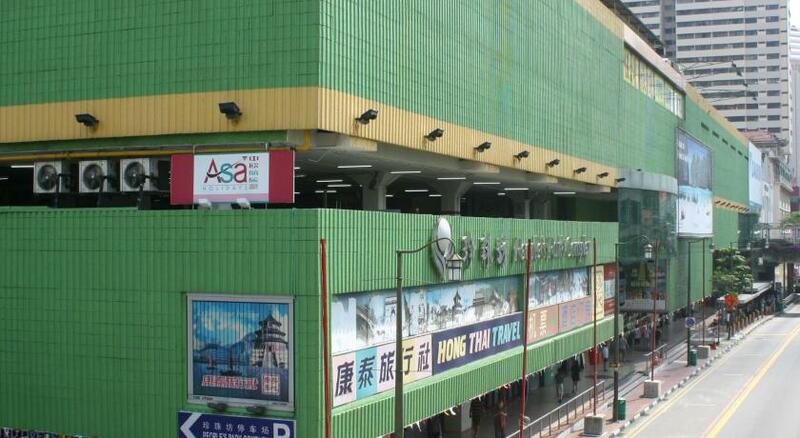 Location was perfect, walking distance to all tourist attractions. Will be recommended to everyone that travels to Singapore! Holiday Inn Express Singapore Clarke Quay This rating is a reflection of how the property compares to the industry standard when it comes to price, facilities and services available. It's based on a self-evaluation by the property. Use this rating to help choose your stay! One of our top picks in Singapore.Holiday Inn Express Singapore Clarke Quay is centrally located in Singapore, only 2,300 feet from the Clarke Quay MRT Station and 0.6 mi from Chinatown. It offers a 24-hour rooftop fitness center, 2 whirlpools and a 100 feet swimming pool overlooking Clarke Quay and Robertson Quay. 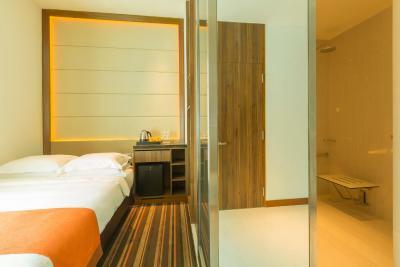 Each air-conditioned hotel room comes with a 32-inch LED TV, an iPod dock and free Wi-Fi access. 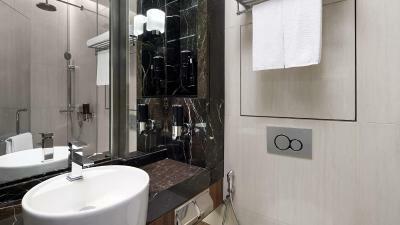 The private bathroom is fitted with a rain shower and toilet, as well as slippers and a hairdryer. 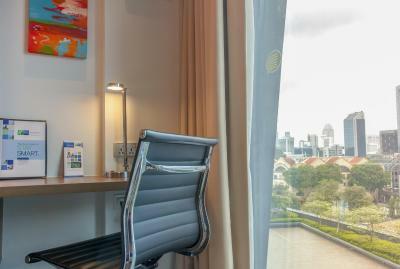 Marina Bay Sands can be found 1.6 mi from Holiday Inn Express Singapore Clarke Quay, while Orchard Road is 1.5 mi away. Changi Airport is a 30-minute drive. 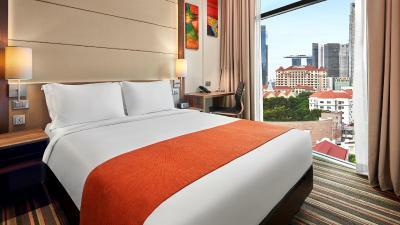 When would you like to stay at Holiday Inn Express Singapore Clarke Quay? This double room features an iPod dock, electric kettle and air conditioning. This twin room features a cable TV, air conditioning, free Wi-Fi and an iPod docking station. This twin/double room features a cable TV, air conditioning, free Wi-Fi and an iPod docking station. Hotel surroundings – This neighborhood is a great choice for travelers interested in culturally diverse food, city walks and sightseeing – Check location Great location - show map Guests loved walking around the neighborhood! House Rules Holiday Inn Express Singapore Clarke Quay takes special requests – add in the next step! Holiday Inn Express Singapore Clarke Quay accepts these cards and reserves the right to temporarily hold an amount prior to arrival. Please note that hotel may contact the cardholder for verification purpose. Winner of the Singapore Green Hotel Award for 2017 to 2018. Platinum award for BCA Green Mark Hotels for 2017 to July 2018. Very good breakfast and location. In regards to the payment process ...I didn’t like the fact that the property was advertised in Australian dollars but charged in Singapore dollars...this added an extra credit card fee. Even though this was stated it wasn’t actually clear at the start of the booking. I would not use booking.com again because of this. We loved the ultra modern structure of the building and the fresh air in the Breakfast dining area and all the corridors not airconditioned ..... that was great !! The airconditioned rooms were perfect . Breakfast was crowded and limited choices. Windows unusually tilted to the outside. It's a tiny thing, but the jacuzzi was cold. We are used to hot jacuzzis so it was a little disappointing. Everything was outstanding- lovely, friendly service, very clean room and bathroom with everything you need, nice breakfast, great price. Lovely hotel and very comfortable stay. Room and bathroom were very small but had everything we needed - modern and very clean. Good comfortable bed. Could just see top part of the Marina Bay Sands Hotel in the distance from our room. Excellent rooftop area - long, narrow pool for swimming lengths plus jacuzzi. Good green area and loungers - lovely place to sit and relax. Choice to sit inside or outside for breakfast. Breakfast included cereals, juice, hot food, bread/pastries etc. All staff very friendly and polite. No a/c in the gym, made it too brutally hot and humid to really work out. The location and the amazing service.